Posted on June 24th, by Dr Rob Yeung . Some time ago, I read an article profiling Travis Kalanick, one of the co-founders of Uber. In the piece, he talks about the importance of being able to “read the data, revise, and adapt”. And I think that’s a better piece of advice than just to keep going. Sure, by all means have goals. But also keep gathering feedback, advice and information – data – on what’s working and not working. For example, you may learn that your goals are unrealistic given the skills or money that you’ve got. If you’re an entrepreneur or business owner, you may discover that investors don’t like your ideas or that customers aren’t buying the products you’re offering. And when that happens, it’s important to read the situation (or, as Kalanick puts it, “read the data”) so that you can revise your plan and adapt your behaviour. So then you may decide that you need to get a new qualification or more experience before you can strive towards your goal again. Not long ago, I coached a marketing manager who wanted to change jobs. At the time, he was working at a bank, but he wanted to do something in the charity sector instead. He put together multiple applications, went for interviews and even got offered a couple of jobs. However, he unfortunately had to accept that the charity sector would not be for him. Most of the larger charities needed someone with more experience of having actually worked within charities; and the smaller charities that were interested in him could only offer to pay him a salary that was a fraction of what he earned in banking. So he had to read the situation so that he could revise his goals and adapt his behaviour. This need to revise and adapt applies to businesses too. Years ago, I worked in a consultancy that specialised in assessing people. However, the owners of the business saw that some other successful consultancies were making a lot of money by offering consulting based around leadership development. So the owners spent money on changing the logo and associated branding of the company; they also spent money marketing the new leadership development offering. After 18 months though, it was apparent that clients were still coming to them for assessment – and hardly anyone was interested in leadership development. Thankfully, the owners were smart enough to read the data and revise their plans. Ultimately, they went back to selling assessment services. When I’m working with clients who are trying out new psychological techniques (for example, to boost their confidence, creativity, productivity, and so on), I recommend something similar myself. I’ve written about it in a few books. 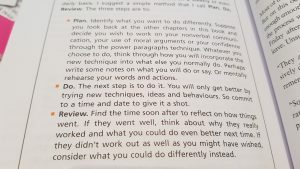 For example, in How To Stand Out: Proven Tactics for Getting Noticed, I advise (on page 214, if you have the book) about a 3-step process that I call Plan, Do, Review. Essentially, the idea is that it’s good to set goals and plans. You then try to do it. But the most important part comes in reviewing how successfully it went before you then enter the planning phase again. So you go through Plan, Do, Review over and over again, making sure that you are learning what works before revising your plan and adapting what you do next. So, allow me to summarise. By all means create a vision of what you want to achieve. Then break it down into goals. But as you learn more about yourself and get feedback on what’s working (and what’s not working), be sure to revise your plans and adapt your behaviour. Don’t just get stuck in the rut of trying, trying, trying to do the same thing. To succeed in life, we often need to change our behaviour. And sometimes, we may even need to change our goals.